Police are appealing for information after an attempted burglary and a burglary in Batley on New Year’s Day. 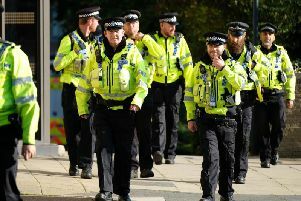 Officers have released CCTV images in connection with the first incident, at a property on Ashcroft Close around 5.25pm. The men tried to get in via a side door and patio door but fled when the occupants heard them and shouted out. They ran off and got into a waiting white, three-door Audi car before driving off. A few minutes later, four males forced entry into a property on nearby Deighton Lane. The only person inside, a woman in her 20s, was locked in the cellar before they made off with jewellery and a watch, leaving in what police believe was the same white Audi. Three of them are described as Asian males and one as a white male. Call Kirklees CID on 101.